A 'fairy's' sewing box containing a pack of Thoth Tarot cards dating from the late 19th century, an ancient Greek gold and emerald earring dating from sometime around the 4th century BC, a pair of scissors and various thimbles. History and legend of the object as recounted by a storyteller. While on an adventure that took him to Italy, Greece and then Crete (in the Cyclades islands), Camille met the lady who would later become his wife. The year was 1900, the first year of the new century or the last year of the old century, depending on who you listened to. The son of a respectable Belgian bourgeois family, and linked by a distant relative to the Lusignans, the young man was given the exciting opportunity to explore the world after finishing his studies. As a newly graduated teacher of Latin and Greek and a keen ancient history buff, he spent a full year travelling to the places and monuments that had fired his youthful dreams . The Iliad, the Odyssey, Caesar, Hannibal, the gods of Mount Olympus - they were all mixed up in the enthusiasm surrounding his departure. He would finally be walking in their footsteps. Rome, Pompei, Olympia, and even Venice and Florence - the trip was more wonderful than anything he could have imagined. He visited Troy, as excavated by German millionaire Schliemann more than two decades before; he visited Sir Arthur Evans, who had recently announced his discovery of Knossos; and there so many other mysteries to explore - as if all of Antiquity was coming back to life right before his very eyes. It was on the island of Delos, in the Cyclades, that he met the young lady. During a walk along the steep paths on the island, Camille lost his footing and fell more than 10 metres into a crevasse. He hit his head against a rock and lost consciousness. The first thing he saw when he awakened was the perfect face of a young lady. She had the radiant beauty of an angel and the delicate charm of a fairy. All his dreams had come true. It was love at first sight: absolute and shared by both parties. He tried speaking to her in ancient Greek, the only version of the language he knew, and she replied in the same tongue. "Don't move. You've been unconscious for two days; you nearly died. But I wouldn't have allowed it." "Don't be amazed. I speak many languages," she continued in French, with an enigmatic pout. "You've broken your leg; you'll have to rest for some time. Unfortunately, this part of the island is very isolated. As there is no way to carry you out, I'm obliged to look after you. You may make yourself at home with me while you recuperate." She lived on the island with her two sisters and earned her living as a seamstress and by spinning wool. Her fairy-like fingers created miniature masterpieces that commanded high prices on the mainland. Throughout his convalescence, they exchanged their shared passion for ancient history; indeed, she seemed to know more than him on the subject. She talked of the heroes of Antiquity as if she had known them personally. Hercules was a bit boorish, Theseus an unrepentant womaniser, and so on. She refused to tell him her name; she was strange in the way that only a young woman can be. Her bright eyes seemed able to read the feelings in Camille's heart, and although she looked like she was about 20 years old, she gave the impression of being haunted by an ancient soul. When he had fully recovered, he asked her to marry him and to return home with him. He couldn't imagine living without her. She said yes enthusiastically. However, as such stories often go in fairytales, her two sisters did not want to let her go. So they fled one moonless night, she bringing with her a small object that she concealed from Camille. "With this, my sisters won't be able to find me. Anyway, it was a gift from old Enyo and I am very attached to it," she told herself. During the return trip, while spending a few days at a hotel in Paris, Camille finally demanded that she tell him her name. "When you call me your fairy, you don't realise how close you are to the truth. And you know that fairies never reveal their names to humans. My name is written with five letters." On the table in front of her she placed five cards, on each of which was written one of the letters of her name. "Remove one card and never look at it. I must insist on this. Use the remaining letters to create a name that you would like to give me." 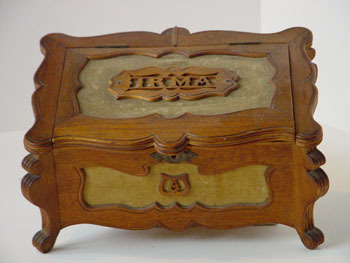 The four remaining letters could be rearranged to write the name 'Irma'. "I think Irma is perfect for me," she added. "To seal our union and our pact, I will put a knot in this piece of yarn and you will always carry it with you. It is a talisman, a kind of amulet that will protect you under any and all circumstances. This is an old superstition among my people, but it will not be my only present. I am going to give you a unique gift." She fetched a pack of divination cards that she had bought that very morning in Paris, and proceeded to mix them. "Everyone's destiny is written in these cards. If we mix the cards, then the apparently random order they assume will unveil the past and the future of he or she who consults them. I am going to change your destiny. Remove one of the cards without looking at it and place it under the concealed letter from my name. Never look at either, for if you do you will lose me forever!" Camille swore that he would never look at the cards. In the meantime, Camille had become headmaster of a school and worked in close collaboration with the Royal Museums of Art and History in Brussels. He retained his fascination with lost worlds. Irma never seemed to age and was fascinated by this civilisation that she discovered and explored each and every day. Sewing and reading tales and legends seemed to be her two major pastimes. On very rare occasions she would read the cards for a friend of the family, and she was always incredibly accurate. He never seemed to be bothered by the usual problems of growing old; he always felt in top form. The couple had no children, but that did not seem to bother them much. 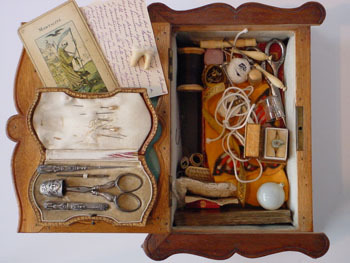 In a box she hid the object she had taken from her sisters, along with her sewing kit and her tarot cards. One day, in 1923, when everyone was talking about the discovery of Tutankhamen's tomb, Camille remembered his first trip to Greece. He was overcome by a curiosity that he could not shake off. 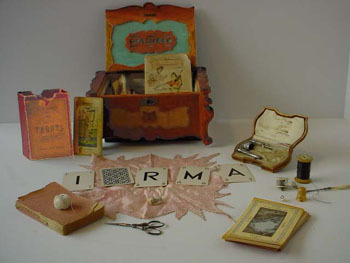 What was Irma hiding in her box? What had she taken from her sisters? She had not banned him from seeing that. While his wife was out one day, he looked in the box and found a glass eye. It belonged to old Enyo, one of the Graeae, and mother of the Gorgons in Greek mythology. At one time, the eye had been stolen by Perseus. It seemed so big. Intrigued, he went to his study and found the envelope containing the missing letter from Irma's name and the tarot card. Reasoning that after such a long time together, she would forgive him this lapse, he looked at the missing letter. It was an 'O', a circle, the symbol of everything and nothing. Adding the O to the letters in Irma's name, he came up with 'Moira'. The name of the Parcae, the Moirai in Greek. Clotho, Lachesis and Atropos, the spinners of destiny, they who know everything - past, present and future - and who have the gift of prophecy. The Fatae, the first fairies whose verdicts are pitiless. An icy shiver ran up his spine along with a feeling of sacrilege. "My sisters warned me that one cannot trust a mortal. You've just lost me forever. And if you want to know, of the three I am Atropos, the unyielding. You have broken your oath and you shall be punished." She took her small dressmaker's scissors and cut an invisible thread. Camille immediately felt the yarn that he had worn for years fall apart. The young woman ran out in tears and was never seen again. In despair, Camille turned over the hidden tarot card - the card indicating his destiny - and found himself staring into the toothless grimace of death. He was buried three days later. The word 'fairy' comes from the old French faerie ('fairyland'), which in turn is derived from the Latin fata ('destiny'), a name given to the Moirai. The first fairies were the Parcae, who were said to have the gift of prophecy. Strictly speaking, the eye is not the eye of the Moirai, but the eye of the Graeae (mothers and guardians of the Gorgons). They are sometimes confused with the Moirai.